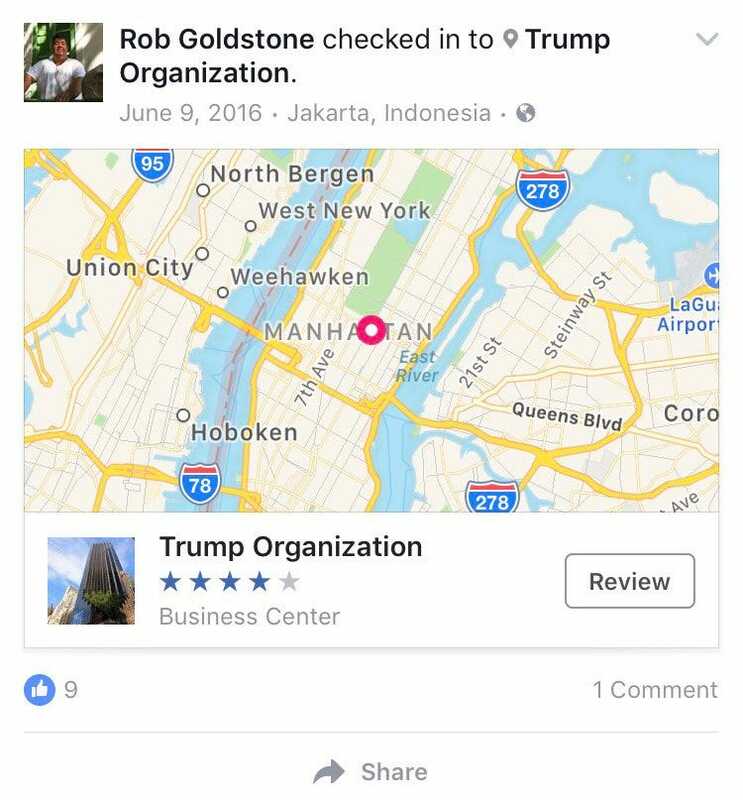 Rob Goldstone Facebook screenshotA photo on Goldstone’s Facebook shows he checked in at Trump Tower on the day of the meeting. The man who set up a 2016 meeting between Donald Trump Jr. and a Russian attormey apparently checked in for the meeting at Trump Tower on Facebook. Music publicist Rob Goldstone reportedly told Donald Trump Jr. in an email the Russian lawyer had damaging information about Hillary Clinton that she wanted to share with him. Business Insider’s Natasha Bertrand reported that Goldstone told The Washington Post he arranged the meeting between Trump Jr. and Russian lawyer Natalia Veselnitskaya at her request. Goldstone said he attended the meeting with Veselnitskaya, and a screenshot of his Facebook page suggests he was at Trump Tower that day. Trump’s son-in-law, Jared Kushner, and then-campaign chairman Paul Manafort also attended the meeting with Donald Trump Jr.
Trump Jr. has been under fire for agreeing to the meeting under the pretense he was given, and he has since hired a lawyer to defend himself against any Russia-related investigations.